The sky will be dark and moonless for at least three hours before the first light of dawn on Sunday morning, April 22, when the annual Lyrid meteor shower is due to reach its peak. The shower remains above one-half of its peak strength for about a day or two, centered on the shower's maximum. 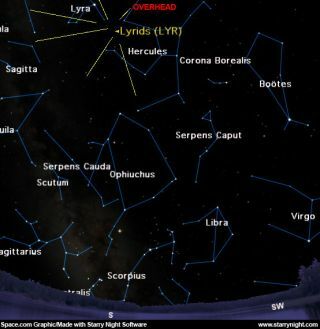 The meteors are called "Lyrids" because their paths, if extended backward, appear to diverge from a spot in the sky not too far to the southwest of the brilliant bluish-white star Vega, in the constellation of Lyra the Lyre. Within a day on either side of the maximum, about 5 to 10 Lyrids can usually be seen each hour by a single observer under good skies. At the peak, the Lyrid rate is roughly 10 to 20 per hour. Vega appears to rise from the northeast around 9 p.m. local daylight time, but by 4 a.m. it has climbed to a point in the sky nearly overhead. You might want to lie down on a long lounge chair where you can get a good view of the sky. Bundle up too, for while it won't be a cold as on a winter's night, nights in April can still be quite chilly. Otherwise, meteor watching is a pretty simple endeavor, requiring no special equipment. While hardly a rich display, like the famous August Perseids or December Geminids, the April Lyrids are brilliant and appear to move fairly fast, appearing to streak through our atmosphere at 30 miles (48 km) per second. About 20 to 25 percent leave persistent trains. Their orbit strongly resembles that of Comet Thatcher, which appeared in 1861 and has an orbital period of about 400-years. Thus, the Lyrids are this comet's legacy: They represent the tiny bits and pieces shed by this comet on previous visits to the Sun. The Earth's orbit nearly coincides with Comet Thatcher around April 22nd each year. When we pass that part of our orbit, we ram through the dusty debris left behind by the comet. There are a number of historic records of meteor displays believed to be Lyrids, most notably in 687 B.C. and 15 B.C. in China and A.D. 1136 in Korea when "many stars flew from the northeast." On April 20, 1803, many townspeople in Richmond, Virginia, were roused from their beds by a fire alarm and were able to observe a very rich display between 1 and 3 a.m. The meteors "seemed to fall from every point in the heavens, in such numbers as to resemble a shower of skyrockets." In 1922, an unexpected Lyrid rate of 96 was recorded, and in 1982 rates unexpectedly reached 80 per hour, so although usually a weak display, the Lyrids have had a history to surprise observers so it's always one to watch.